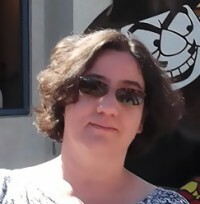 On our trip to Florida last October we decided to spend a few days visiting Universal Orlando. As this was a last minute decision, we unfortunately were unable to stay anywhere ‘onsite’ as every single resort was completely full, arrgh! Still, lets not allow a small detail like ‘fully booked’ get in the way of a good old fashioned snoop! We wasted no time popping along to investigate. If you’re visiting Universal Orlando soon, you might also want to read my review of the Universal Quick Service Dining Plan that’s available to all guests in the theme parks. 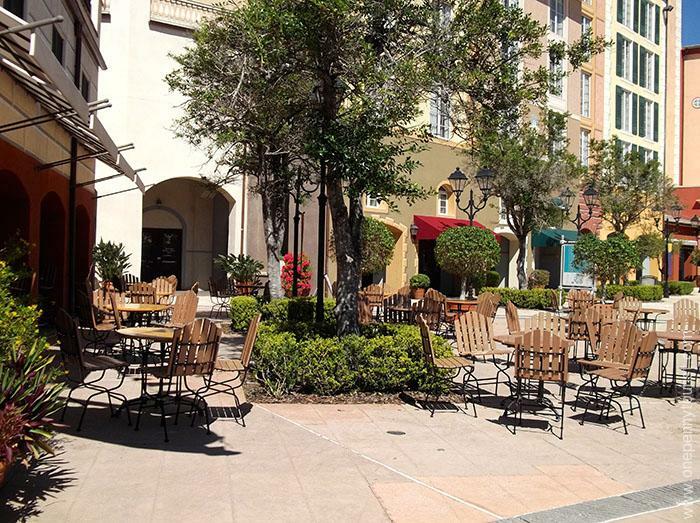 This resort is about 15 minutes walk from the Universal parks or you can use the resort transportation to take you there. It was a glorious day so we walked. We got our first peek of the hotel as we approached the bridge near the end of the walkway. Oh boy, did we have a treat waiting for us after passing the bridge and reaching the corner. 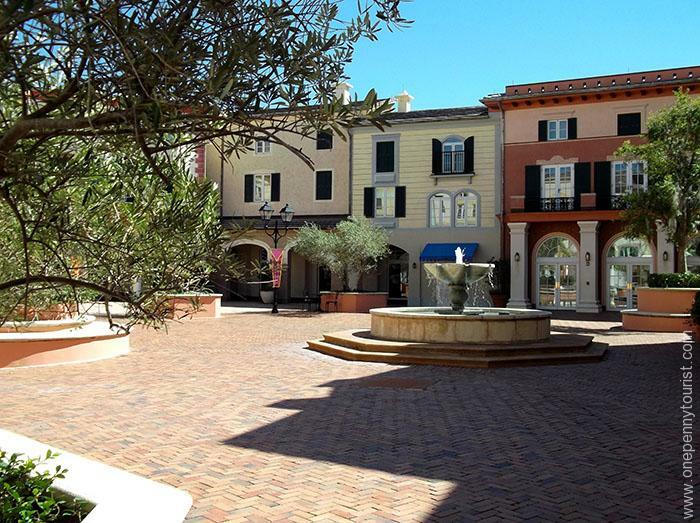 It’s hard to believe this is a hotel that’s just a few minutes walk from a huge theme park. I can’t emphasis enough that the theming is nothing short of fantastic. Along the harbour side they have little Italian scooters parked there, just to set the scene. The harbour is also full of little boats, these are all just here for decoration too. 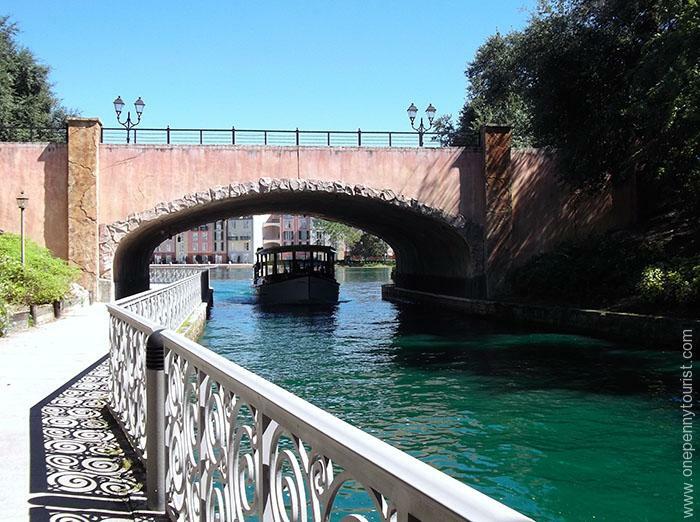 The water launch is the only real boat in the area, delivering guests back and forth to the theme parks from the hotel’s waterfront pier. As it was the middle of the day, the resort was eerily quiet – I’m sure guests not in the parks were hanging out at the pool instead because there wasn’t a cloud in the sky that day. 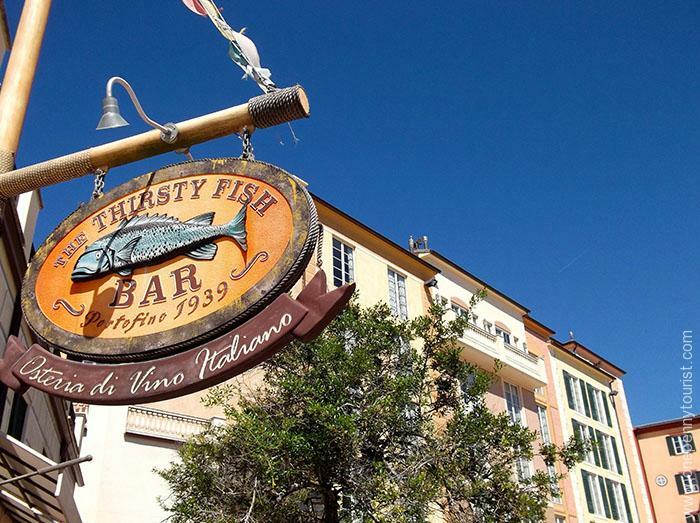 The Thirsty Fish Bar overlooks the harbour side (incidentally, I love how blue the sky looks in the photo above). I could imagine sitting there in the evening, enjoying the atmosphere but it was early and quite hot to be sitting out at that time of the day. After a little exploration around the harbour area we started to investigate a little deeper. 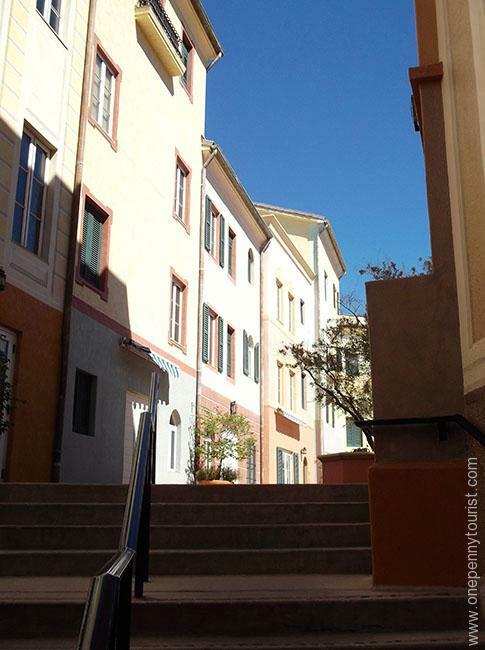 This was pretty cool as there are side streets, just as if it was a real little Italian town! We had no idea where this would take us and had another surprise waiting for us at the top. It’s difficult to find the words to describe the sheer detail and effort that has gone into this resort. Bloke and I were impressed at virtually every turn. 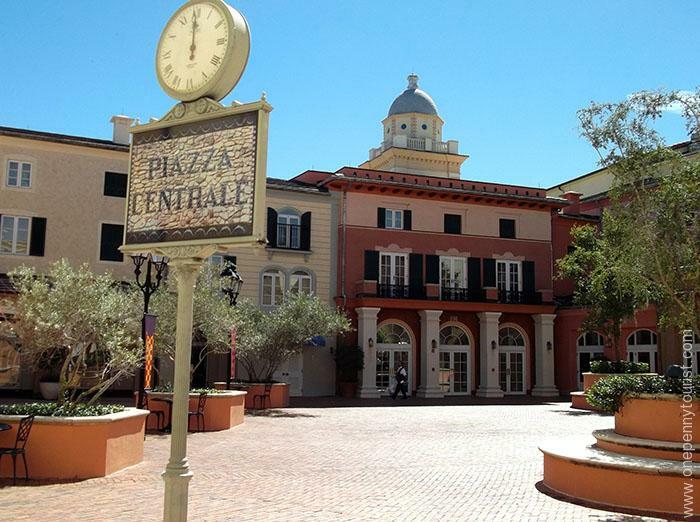 This area is the Piazza Centrale and the building at the back is actually the main hotel reception where you check in to the hotel on arrival. Of course, we had to go and have a peek in there too. 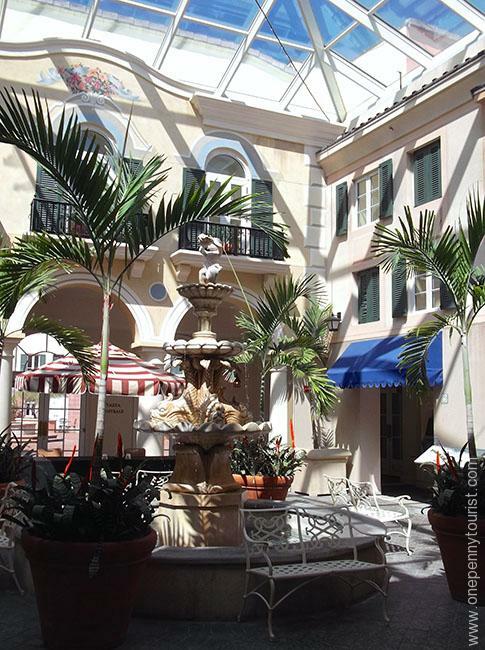 They have this wonderful atrium area inside with a small fountain – a little oasis, no matter the weather. We also found a cosy looking bar/lounge furnished in dark woods and muted tones, but it was closed at the time of day we were there. As we’d experienced most of the resort in reverse (starting at the Bay and ending at the Check-in area), we took the last few steps outside the hotel. 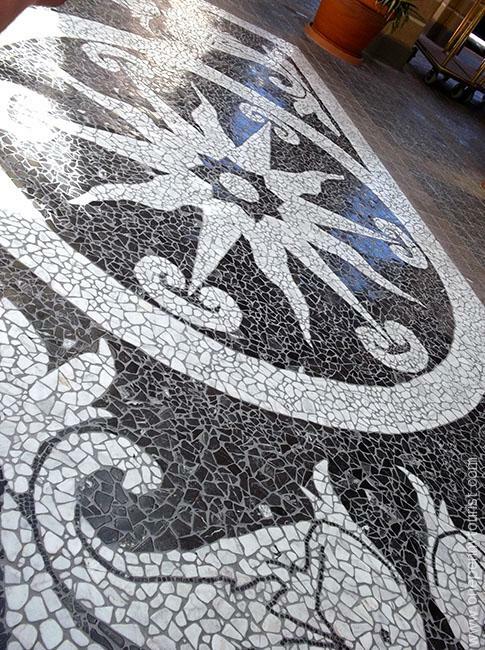 I just had to stop and take a photo of this huge mosaic floor effect in the entrance. 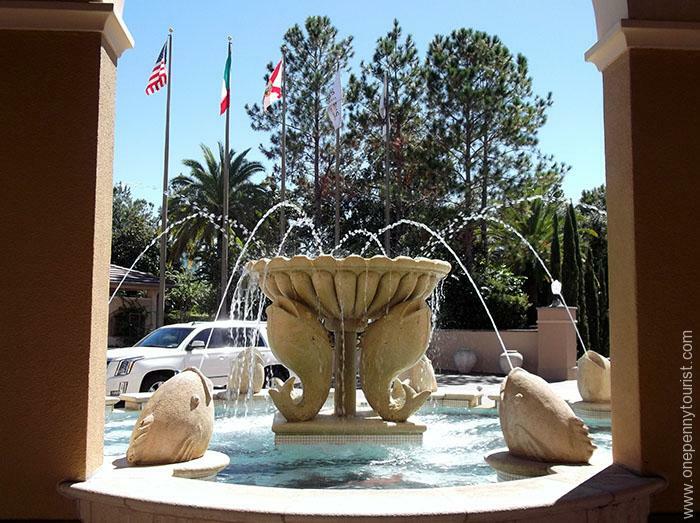 There is also a large fountain forming part of the entrance. Finally, a view of the complete entrance of the hotel from the front – this is what greets you on arrival. 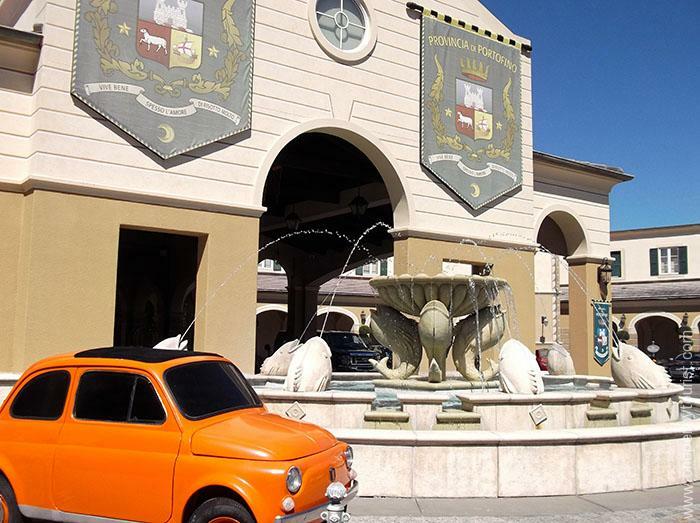 Yes, even that little orange Italian car parked haphazardly beside the fountain! 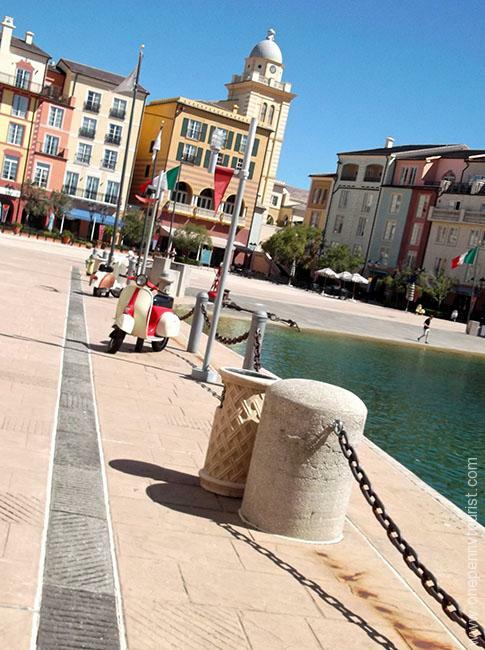 Just like the scooters on the harbour side, that’s part of the resort’s theming. And so our little bitter sweet tour of Portofino Bay Hotel was concluded – a hotel we might have stayed at if only there had been availability. We were so impressed with this resort, the photos don’t do it justice. It’s definitely a hotel that’s high on our future stay wish list. 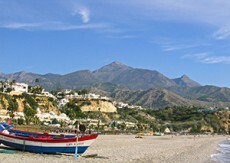 Our other choice would have been the Royal Pacific Resort which we also explored. I’ll be writing about that tour in future and let you know which hotel we preferred. 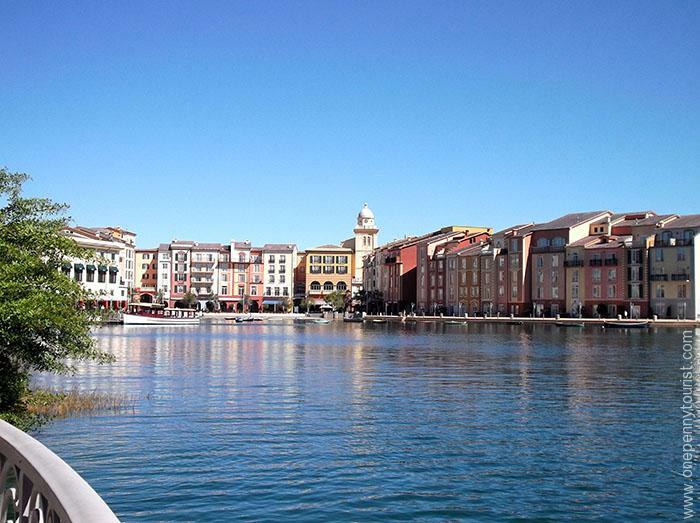 Have you ever stayed at one of the Universal Orlando onsite resorts? 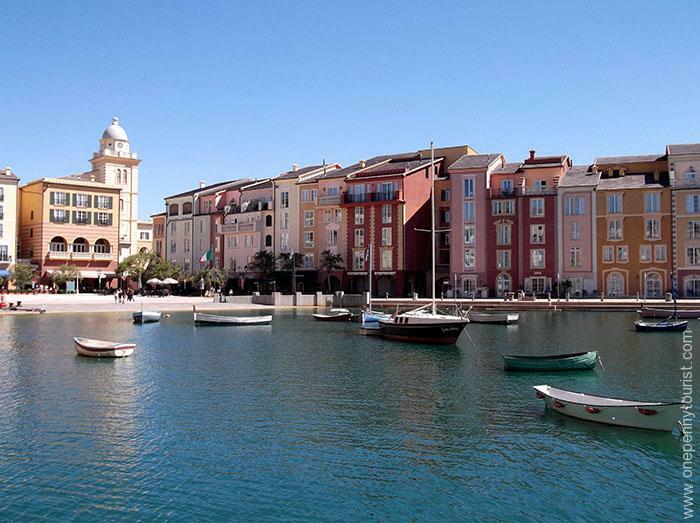 Does this virtual tour of Portofino Bay tempt you at all to try them?